You’ll be personally met by our company representative upon arrival at Entebbe airport, transfer to Kampala for overnight stay and dinner. After Breakfast, your guide will transfer you to the Waterfront club for boat ride to Ngamba Chimpanzee Island. This a either a half day of Full day activity where you watch and feed Orphaned Chimps, Birding in the Forest and Learn more about these primates and their way of life. You will return to Entebbe and back to your accommodation. Early morning to transfer to Mabamba swamp on the shores of Lake Victoria where you go Birding and this is also the home of the Rare Shoebill Stock. In the Afternoon, visit the Entebbe Town and later transfer to Kampala at your accommodation. Begin the day with a cup of African Coffee. Thereafter, cross the Nile by ferry to the northern bank of the park. Your guide will help you spot Elephants, Lions, Cape buffaloes, Rothschild’s giraffes, hartebeest, Waterbuck, Oribi, Bushbuck, Bohor reedbuck, hyena and if you are lucky, the leopard. Return to the hotel for breakfast and lunch. After lunch, go for a boat safari upstream the calm Victoria Nile to the base of the falls stopping just tens of meters from the “Devil’s Cauldron”. En-route, marvel at the toothsome hippos, crocodiles and over this 17 km stretch you may see elephant, waterbuck and Uganda Kob, crocodile. This is also a zone of many bird species like Goliath heron, Egyptian goose, pelican bee-eater, kingfisher, hornbill, cormorant and the rare shoebill stork. There you leave the boat and start your – quite heavy – hike to the Top of the Falls (approx. 1 hour). See where the world’s longest river explodes violently through a narrow cleft in the Rift Valley escarpment to plunge into a frothing pool 43m below. Your driver/guide will be waiting for you to bring you back to the lodge. Drive south via Hoima to Fort Portal through verdant countryside and past traditional homesteads and farms along Albertine Rift escarpments. Fort-Portal rests in the shadow of the fabled Mountains of the Moon. Overnight stay at your lodge with a stunning location overlooking a dramatic Crater Lake and the fabled “Mountains of the Moon”. After early breakfast, report at Kanyanchu Tourist Centre where tourist activities begin and set out to track chimpanzee in the forest. Chances of viewing the chimps are over 90% but not a guarantee. Kibale forest national park is one of the beautiful and stunning forests in the Uganda. It is home to our closest living relatives the endangered Chimpanzee, the threatened Red Columbus monkey and the rare L’Hoest’s monkey. The forest also boasts of having one of the highest diversity and density of primates in Africa totaling 13 species including the Black and white Colobus, Blue monkey, Grey-cheeked mangabey, Red tailed monkey and Bush babies and Pottos. After lunch visit Bigodi Wetland Sanctuary from where you will take on a guided walk around the Swamp which will provide you with the opportunity to see a wide range of flora and fauna. View a variety of butterflies, birds and other insects. Have a tour of the crater region around Ndali lodge. You may also stop over at any tea plantation along the road if you wish. Return to your accommodation for dinner and overnight. Have an evening tour of the crater region, visit “top of the world’’, the natural bridge. On a clear day you will be able to have a view of the snow cap on the Rwenzori. After breakfast, drive to Queen Elizabeth National Park viewing the mystical Rwenzori Mountain range for much of the journey. Check in at your accommodation facility as you wait for your lunch. 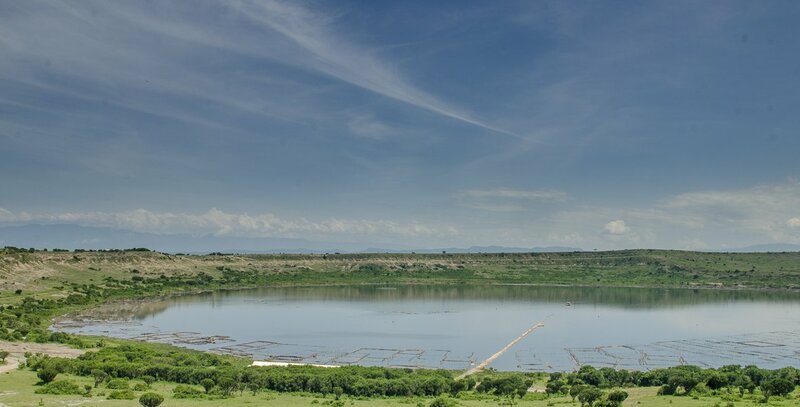 After lunch, take on an afternoon Launch cruise along Kazinga Channel – one that joins Lakes Edward and George. 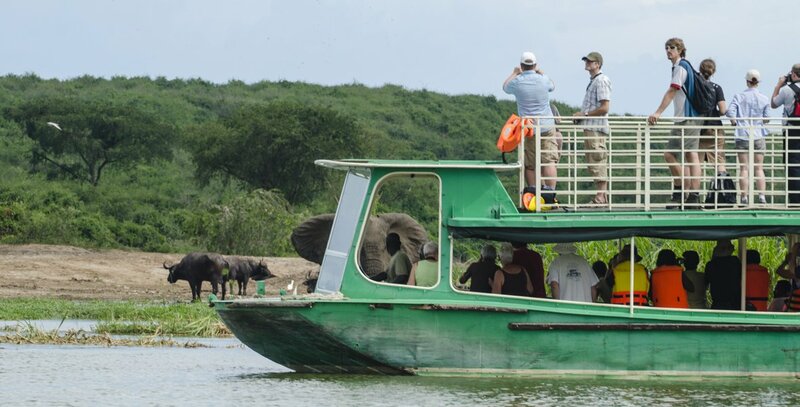 The cruise is a wonderful way to see hippo, buffalo, kob and the occasional Nile crocodile (which up until recently did not inhabit this area) and a spectacular bird watching on the water bank. Many who experience the launch cruise consider it the high light of their entire African safari. Rise very early with your packed lunch take on a morning game drive to catch-up with the early risers and predators returning to their hideouts. You will most likely meet grazing Hippos, Elephants, and Lions, spotted Hyenas, bush buck, water buck, stripped jackal, comical warthogs and the elusive leopard. Proceed to Maramagambo forest. Many surprises await you here for example pythons are often observed in the crevices of the bat cave floor using the bats as a source of food. The cave is near a picturesque formerly Blue lake and Hunters cave. You may also see forest birds such as bat hawks, brown eared woodpecker and other primates. With previous day’s memories, enjoy your breakfast ready for guided Chimpanzee/primate walk along Kyambura Gorge to look for habituated chimps through the gorge. After the primate walk, proceed to Ishasha sector. You will drive along the deep and wide dry craters that are occupied by savanna grasses and acacia. The drive takes you through the unique western rift valley escarpment and the (southern part of Queen Elizabeth National Park) Ishasha sector where you will take on yet another game drive in search of the tree climbing lions before proceeding to Bwindi Impenetrable forest national park. The journey takes about 4 hours but driving through interesting features. Arrive in Bwindi Impenetrable forest in the evening. The forest itself is lush and green and there are streams running through it. After early breakfast, set off with guides to for Gorilla Trekking. The thrill of your encounter will erase the difficulties of the potentially strenuous trek. Bring jungle boots and rain jackets because the park is often wet. 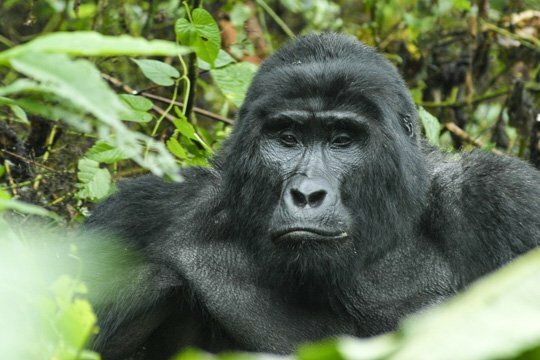 Spend time in awe watching the gorillas go about their activities. Each gorilla safari encounter is different and has its own rewards, but you are likely to enjoy the close view of adults feeding, grooming and resting as the youngsters frolic and swing from vines in a delightfully playful display. Time permitting, spend the afternoon on a community foot safari to explore the life style of the people living and surrounding the park. Return to camp exhilarated to relieve the encounter with friends over a drink. After an early breakfast transfer to Lake Bunyonyi in Kabale. Lunch break is made in Kabale. The afternoon is spent on relaxation and sightseeing around the Lake. Whole day dedicated for relaxation and after Lunch break then take on an afternoon boat ride to some of the islands on the lake. After breakfast, drive to Lake Mburo National park. This time a visit to Igongo cultural center to learn and experience the life style and culture of the Ankole and the Bahima. It is only at Igongo where the future meets the past. Morning game drive. The park is renowned for zebras, impalas, buffaloes, hippos, topi and elands including the rare shoebill, crested crane, pelicans, fish eagle, heron and many water birds. Afternoon boat cruise amidst the Hippos is amazing. After early breakfast, take on a morning Bush walk. Lake Mburo National Park is a very special place; every part of it is alive with variety, interest and colour. It contains an extensive wetland. You are likely to see elands, impalas, waterbucks, warthogs, and zebras. There-after drive back to Kampala with a stopover at the Equator monument and later transfer to Entebbe to catch up with your evening flight back home. Meal plan: Breakfast & lunch .